Al Aqsa Brigades video displays an original system for camouflaging rocket launchers. An Al Aqsa Martyrs' Brigades video showing rocket fire from Gaza displayed another way in which terror groups for camouflage rocket launchers in civilian areas, to avoid detection. The video shows a Brigades member dressed in civilian clothes pushing a cart of the kind that is used to sell “beigeleh” type bread in Jerusalem's Old City and elsewhere. The cart is covered with cardboard. The man places the cart near a private home and removes the cardboard cover. A few seconds later, the launch of two rockets from launchers connected to the cart can be seen. 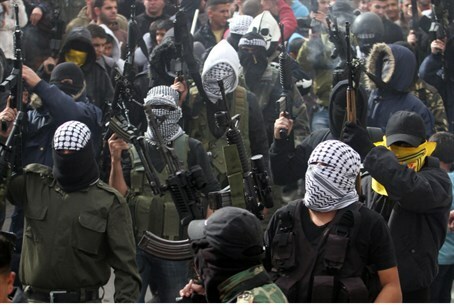 Significantly, the Al Aqsa Martyrs' Brigades is a branch of Palestinian Authority leader Mahmoud Abbas's Fatah party. Other Fatah videos showed the launch of rockets from buried launchers deep in the ground, as the group has begun claiming responsibility for some of the rockets launched against Israeli civilians - although the majority have been claimed by Hamas and Islamic Jihad. The use of human shields by terrorist groups in Gaza has been well documented since the start of Operation Defensive Edge. Hamas spokespeople have openly encouraged the use of human shields, and the terrorist group has called on civilians in the area to ignore IDF warnings to evacuate prior to attacks.